The Jets have everything to lose this week, but Todd Bowles isn’t getting caught up in the melodrama of facing his predecessor, Rex Ryan. Nor will the Jets coach use it as a motivational selling point with his players. It’s only fitting that the Jets’ season hangs in the balance in Week 17 with Ryan’s Bills as the final obstacle in their path to the postseason — a destination the Jets failed to reach during Ryan’s final four seasons with the franchise. And they already know their ex-coach will use every motivational trick in the book to ensure his Bills ruin their storybook run. “Rex is a prideful guy, so I know he’s going to have his team ready to play,” said outside linebacker Calvin Pace. 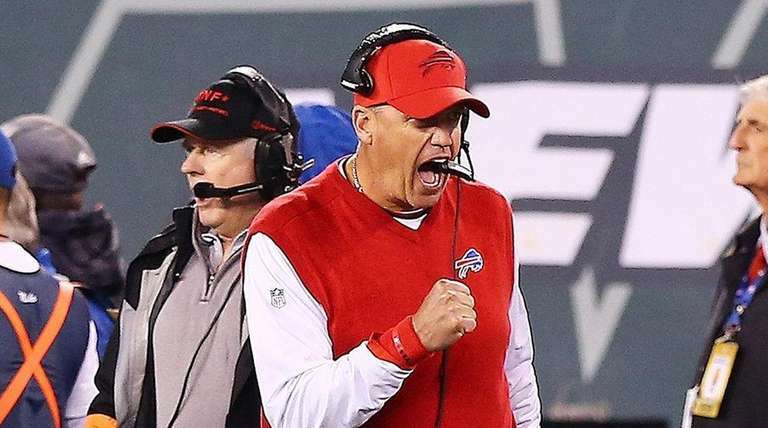 The Bills (7-8) now find themselves in a situation Ryan has become all too familiar with: no shot at the playoffs and only pride left to play for. But the Jets have seized control of their playoff destiny with five straight victories — the most important being Sunday’s dramatic OT win over the Patriots — and a Steelers’ loss in Baltimore on Sunday. That means the stage is set for one epic showdown in Western New York. If the Jets (10-5) beat the Bills, they’re in. And Ryan’s former players know he’s aiming to play spoiler on his home turf. Following the Bills’ 16-6 win over the Cowboys on Sunday, Ryan made it clear he’s not pleased about missing the playoffs in his first year in Buffalo. On Monday, he gave his former club high praise. He also downplayed how much his players will be motivated by possibily being the team to ruin the Jets’ season. “That is a possibility,” Ryan said, a day after his running back Boobie Dixon called the Jets matchup “the Super Bowl” for them.